Last week’s experiment was a success, so we will try to keep it up. Last Monday you started your week by visiting Machine Learning etc. to read the slightly creepy story of how you can patent an algorithm in the US (despite the law being explicitly against it). Then on Tuesday you headed over to Math4Love to pick up some ideas for mathematically inclined books and games for kids and their parents (and if that wasn’t enough you just went back on Friday for one more). On Wednesday, after admiring the high typesetting quality of the ongoing lecture notes at I woke up in a strange place (which is impressive given the restrictions of wordpress.com), you pondered how often you had the same misunderstanding at a party that Women in mathematics discussed; to relax even if you have already seen it you also watched the amazing RSA-talk on Changing the education paradigm by Sir Ken Robinson thanks to the reminder at Mathematics and Multimedia. On Thursday you learnt from Freakonometrics that bikers and nuns are the same (if all you want is to sit in your designated seat on an airplane). Heading for the weekend, you made sure to check out the AMS grad student blog with a post on interdisciplinary communication, spent some time at Gaussianos to learn that not all Neumanns are called von and John, read up on the (non)sense of gender discrimination by insurance companies at Understanding Uncertainty and finally enjoyed the beauty of soapy mathematics at Images des mathématiques (and if your French is not good enough you used a translation). Saturday, you learned about Piet Hein (and his game TacTix) at Observational Epidemology while on Sunday you stepped out of sequence for something completely different at mathjokes4mathyfolks. After understanding that finding love might be harder than finding a secretary (at least according to Michael Trick) you grasped technology readiness levels thanks to Nuit Blanche. And to finish the week QED Insight reminded you of the end of Black History Month in the US. The best part: even though all these posts were posted last week, you can still read them 😀 Enjoy! Welcome to a new experiment! Starting mathblogging.org made all of us read more mathematical blogs than ever before. But not everybody can be this obsessed, so we thought we’d follow the age-old blog traditions and tell you about the stuff we found interesting last week. 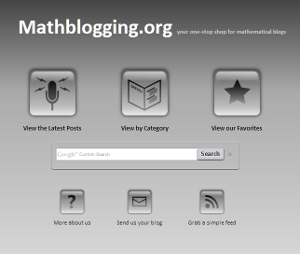 Since this is the mathblogging.org blog, we restrict ourselves to posts you can find via mathblogging.org. The week started off with good news for Polymath4, the referee report is out and looks good. Monday could not get enough of Valentine’s Day mathematics and M@atematicamente had a sweet collection of links (in case your Italian is not up to speed, google translate helps). If you’re Italian is very good, you should check out the birthday post for Galilei on Rudi Matematici, otherwise you could have spent Tuesday at The Accidental Mathematician learning that math is strictly less than reality (from a modeling point of view); for a wonderful proof by picture, head over to reperiendi — a brilliant nerd-alert. On Wednesday, QED Insight explained how you end up not knowing what a basis is if all you do is beat the system and Scott Aaronson led you to his very enjoyable TEDx talk. The entire week saw Vi Hart visit the Pforzheimer House at Harvard (the link leads to the last post of the series, so you might want to go back and stare in wonder at the others, too). On Thursday, Kareem Carr send you over to a discussion on mathoverflow to learn that William Thurston just keeps on inspiring. On Friday you could also get some classic Terry Tao exposition, in this case, how to derive the Szemerédi-Trotter Theorem via the polynomial ham sandwich theorem. But you could also learn from Division by Zero that Abraham Lincoln had tried to square the circle (and, of course, wasn’t a crank). This week could not go by without many posts on Watson winning Jeopardy, bit player wrote an excellent piece on Saturday. And on Sunday, Travels in Mathematics continued the blog experiment of 400 words in 30 minutes, this time on how he chose mathematics. Welcome to this week’s update! There wasn’t much going on from the developers’ side this week. We’re working on some new features but nothing to actually write about yet. We’re also trying to come up with a good solution to un-clutter the Category view — it’s becoming crowded. Of course, we welcome your suggestions! We have also added 12 more blogs and we’re nearing the count of 200 entries! We’re planning a bit of a face lift for mathblogging.org. It’ not too different from what you see now, but we thought we should leave the old icons behind. The ones currently in use are public domain coming from the US National Park Service via the open clipart library. They were always meant to be a temporary solution and sometimes didn’t make sense (the gas station sign in particular…). Last week, Felix found the time to design some spanking new icons! We had done a brainstorming some time ago, but as usual Felix rocked with his amazing inkscape skills. Expect to see the full set of new icons on the site soon! (and don’t worry — we’ll be sure to mention the face lift when it’s online). We are also working on a couple of improvements. Nothing major, mostly a search functionality using Google’s customized search. Unfortunately, this comes with advertising (unless you pay or are a registered non-profit) and we’re not yet sure how we want to integrate that (or if at all really since we’d like to keep the site ad free). There’ll also be some slight updates to increase usability. In particular, the overview over all blogs (the “by category” view) has become more and more cluttered. We’re still brainstorming on what major overhaul would help most, but some slight changes will be coming with the face lift to improve usability a little. You are currently viewing the archives for February, 2011 at Mathblogging.org -- the Blog.